Looking for a car that gets crazy great gas mileage but don’t want to spend a lot of cash? This list of knucklebusting (can we call them classic?) small cars from 1978 through 1981 haul down some impressive gas mileage figures and can be had for chump change … if you’re handy. It’s not just that they’re cheap … these cars are past the magic 25 year point that may actually make them qualify as antique cars, dependent on state regulations. While the thought of a rusty old Dodge Omni or Plymouth Horizon with historic plates might lead to hysterics, the owner can take solace in those remarkably high gas mileage figures. @Karl: I drive a mostly stock Pinto now, with a 2.3 and a 4 speed. I get around 25 city and 28-29 highway. I got over 300 miles in the 11 gallon tank in a highway trip this summer. And this is with the car running a little rough. And it’s been reliable as hell for a car that hadn’t been driven for years before I got it. I had some charging system issues early on, but now that those are resolved it doesn’t give me any problems. Aside from it marking its territory that is, haha. I’ve got to say the Pinto is my favorite out of all of the vehicles I’ve had, it’s really fun to drive even though I’m stuck doing 55-60 on the highway when the speed limit here is 65. I had a gas 87 Isuzu P’up about 2 years ago and I was getting about 35mpg highway. No muffler, and it backfired every time I threw it in 3rd and stomped the gas pedal. It’s a shame the frame was too rotted and I had to get rid of it. Has anyone thought about the gas they are selling us today? It’s not the same as it was 30 years ago. 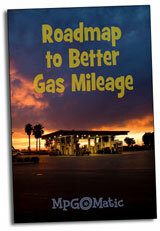 Why allow consumers to go the ‘extra mile’ when it comes out of your (gas producers) pocketbook. They figured it out and fixed it. Those numbers do seem high though. I drove a 99 Saturn 1.8L and it was a great GREAT highway car. Topped out around 41mpg at 70mph. Faster it would only drop to 36mpg. At 46-52mph with a tail wind 48mpg. 1) Today’s gasoline is different, no doubt about that. An E10 (10%) Ethanol blend provides less fuel economy than “pure” gasoline. One of our goals in 2012 is to test “pure” gas vs E10 in a number of different vehicles. You missed the best ones of all- the Mercedes diesels. My 61 190Db has a mileage chart in the drivers manual which shows 40 mpg at 60mph and 68MPG at 40- I have proven both. My 84 190D-2.2 has averaged 42MPG for the last 5 years in a mix of 75MPH Highway and city driving with an accurate documented best of 54MPG on a hot day with a tailwind on the highway. And all in comfort and style! My bit old 84 300SD only gets 30mpg (In a HUGE 4000lb luxo sedan). And they are all reliable as an anvil and easy to maintain. A VW Jetta is bigger than a VW Rabbit but gives more MPG using the same engine????? C’mon research dept.. I think the MPG’s in above table were from EPA data. Years ago the EPA estimates were way overrated. In past couple decades the EPA finally adjusted their system so estimates are much closer. On the other hand, 1972 Datsun 620 pickup weighs about 2300 lb, 170 inches long, 98 HP carburetor motor. I used to easily get over 30MPG combined. The smallest pickup you can get today is the Tocoma, 190 inches, 60% more HP, weighs 900lbs more. I want a pickup to occasionally carry sofa, wheelbarrow, big table, push lawnmower, etc. Everyday use is to commute to work. Don’t need that HP, length, weight. It would suit me just fine that if I load it up with 500 lbs of lawn products on the weekend that I would have to accelerate slower. This summer I will pick up my grandmothers 1980 chevette. I have understood that these cars are UGLY but get good gas mileage and last forever (this one has 56k because it has been parked since 85). I drove it around and its a dog (no power at all) so I was wondering what mods can be made to pep up the power which wont hurt gas mileage? So far Ive been told to replace the carb to manifold gasket with a gasket without a screen, drill holes in the air cleaner housing to increase air getting to the filter, and disconnect the smog pump. Can you add anything? If I get one of these and replace the old engine with a newer injected four cyl, will it get even better mpg? the chevy luv does not get anywhere 53 mpg highway. i drive a 1980 chevy luv and i average 30mpg highway driving at 55mph, i have electronic ignition, and aftermarket more efficent carb and have never seen over 32mpg with it. do not expect anything over 28 combined mpg from one. @Joe – I’d reckon your Chevy Luv is a gasser, not a diesel? I had a chevy vega actually liked it. But u had to check the gas and fill the oil when u stopped at a gas station. Considered many cars, along with the Datsun B210, back then. Almost bought a Volvo Sport at the time or Saab(good buy), but finally bought a Subaru.The only car of the bunch that was any good was the B210……oh, well. This list is totally inaccurate. I have owned many of the cars listed. If you take off at least a good 10 miles per gallon it would be somewhat accurate. Very misleading !